Panel 4, the first one on the tope of this page, is a messy bit full of a camand to move the camera's view. In this panel, the camera is zooming in as the girl approaches a pool and kneels next to it. The next panel (and the two smaller ones next to it) is another camera move called a truck or a tracking move. Here, the camera moves on a track, not quite unlike a very small train, to go around the girl so we are now looking right at her. 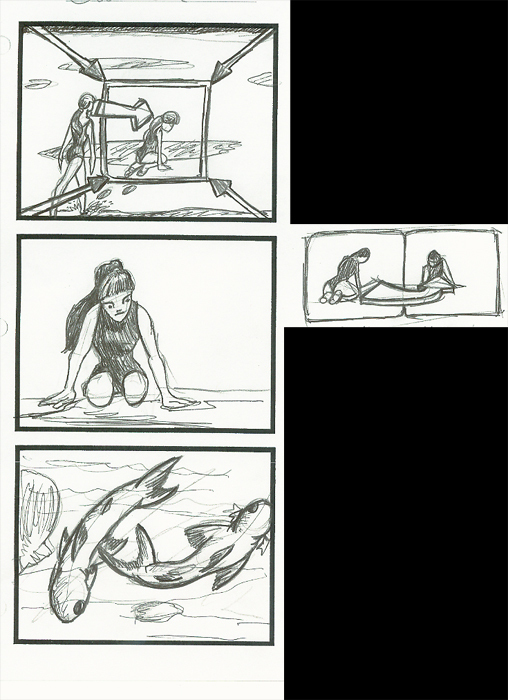 Panel 6 is a close up of the fishies that the girl is looking so intently at.